The Ten of Pentacles shows an old, white-haired man wearing an ornately embroidered robe, sitting with his two loyal white dogs at his feet. A younger couple stands nearby with a small child. The man is a wealthy patriarch who has achieved a great deal during his life and is immensely gratified that he can now share his wealth and abundance with his loved ones. His successes and accomplishments are now providing financial security and certainty to his family. He can already see the legacy he has created. The man and his family gather in the courtyard of a large castle, marking their prosperity, comfort and financial security. On the archway are family emblems and flags, a symbol of their history and ancestry. Their wealth goes way beyond material comfort; the man and his family have a deeply rooted connection to their lineage, home and community. The Ten of Pentacles is a positive sign that you have reached a point of completion and accomplishment in your journey. 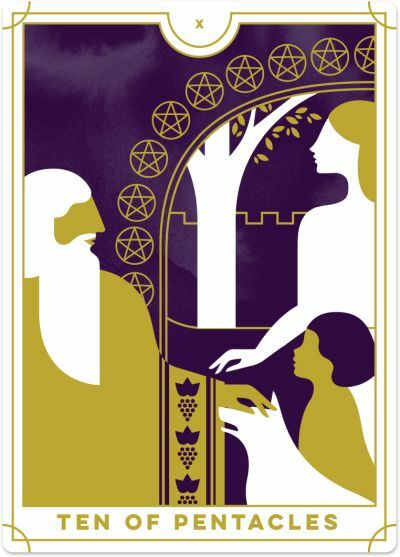 As a Pentacles card, this sense of accomplishment is likely to be the result of a successful career path, smart financial investments, a stable home environment and a possible committed and long-term relationship. You have accumulated wealth and abundance through your hard work and dedication and can now relish sharing this wealth with others. This is one of those cards that promise everything will eventually come together and you will be proud of everything you achieved. When the Ten of Pentacles appears in a Tarot reading, you are surrounded by wealth and blessed with financial abundance. There is no ‘wanting’ for any more; you have everything you need, especially within the material realm. You are financially secure and trust that, because of your personal successes and accomplishments, you will always have what you need and desire. You express sincere gratitude for fulfilling your material goals and dreams. This card reflects permanence and creating a lasting foundation for future success. It is a card of commitment to a sustainable future, taking into consideration not just the short-term gains of a particular venture but also the long-term benefits. A consistent approach will achieve success that will last the test of time. The Ten of Pentacles indicates that you feel compelled to share your success with others to make sure they are well cared for, too. You worked hard to get here, and now you can see the bigger impact your accomplishments have on others. You are the ‘provider’ or the breadwinner, bringing financial security and stability to your family, ensuring they have everything they need to live a happy and comfortable life. And it brings you deep joy and satisfaction to see your loved ones enjoying your wealth and abundance. The Ten of Pentacles is also a sign that family is very important to you. Being surrounded by the people you love and who share your DNA and ancestry brings you great joy and happiness. You know you can trust your family whole-heartedly and they will be there for you, no matter what. Your home life is happy, and you can provide your family with the security they need. You are also strongly connected to your family history and heritage, a part of the long lineage that goes before you. It represents tradition, being a part of something bigger and realising that the blood of your ancestors flows through your veins. Upright the Ten of Pentacles is about wealth accumulation, an established family and home life, and attainment in the material realm. Reversed, you may question whether you want to live this way. Do you really want to be chasing the next $1,000 so you can own the latest Jimmy Choo shoes? Do you really want to be pushing for marriage or a family instead of just enjoying what you have right now? Are you staying in the same job for decades only for the security? 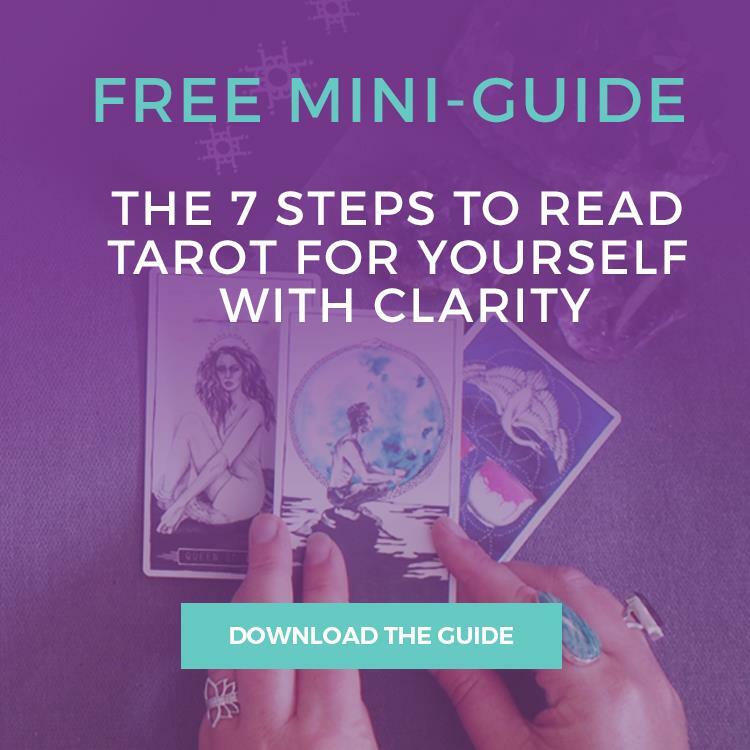 When you see the reversed Ten of Pentacles in a Tarot reading, be ready to question your need for stability, security and commitment in your life. It may sound good on paper or might be what is expected of you – but is it what YOU want? The reversed Ten of Pentacles comes as a reminder that sometimes, wealth can be a trap. When you surround yourself with expensive things and live a luxurious lifestyle, you may want more and more and more, never feeling satisfied with what you have. For example, you splurge and fly business class, only to realise you can never fly economy again. Or you buy a bigger house that looks like a resort, only to realise you now need to pay for added maintenance and cleaning to keep it in its pristine state. You may find you burn through your financial reserves as you desperately try to support this higher standard of living and are unwilling to ‘downgrade’ even if your cashflow diminishes. Your feelings of self-worth may be inadvertently wrapped up in your wealth; if so, it’s time to unravel that connection and see that you can still live a happy and fulfilling life, even without the Louboutins and resort-style home. The Ten of Pentacles reversed may show that you are experiencing challenges or setbacks with financial or job security and family stability. Your investments may have lost significant value, your marriage may be on the rocks, or your job may be at risk. It is time to re-evaluate your position and choose a course of action that will help you regain your sense of security and self-worth.